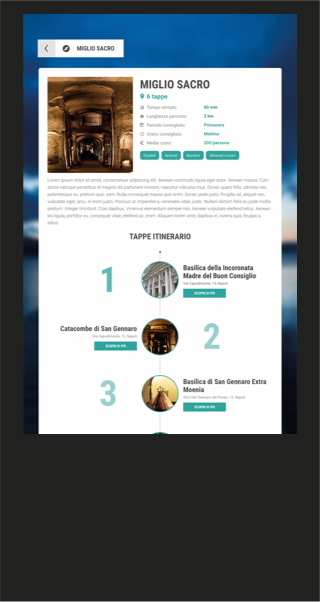 Create a system which run on a multimedia totem and on smartphones for the enhancement of the tourist heritage of the area. In particular it have to allow users to quickly have all the commercial, touristic, health activities and the points of interest on their smartphones and to make them accessible by GPS Navigator. Arrived in a place, don’t you know what to do? Open Trick Travel and discover the totem near your position. He will guide you during your trip. The mobile app allows a tourist to have in his hand everything he needs to enjoy the area and to discover places and activities which the big tourist guides do not mention. In particular way the tourist has a simple and intuitive tool to reach all these places and follow a tour without a guide in the flesh. Grouping points of interest has never been so easy for associations who buy a Trick Travel totem. We have created a highly functional back office for the points of interest management, the tour and for the management of news and notifications. The totem, an extremely durable and advanced touchscreen device, puts in it all the place informations and shows the news and events that are loaded directly from the heads of the area.